The Gamma Ray log is a continuous measurement of the natural radioactivity emanating from geological formations. Isotopes concentrated in clays; thus higher radioactivity in shales than other formations. Sensitive detectors count the number of gamma rays per unit of time. *Gamma ray logging is a method of measuring naturally occurring gamma radiation to characterize the rock or sediment in a borehole or drill hole. It is a wireline logging method used in mining, mineral exploration, water-well drilling, for formation evaluation in oil and gas well drilling and for other related purposes. Different types of rock emit different amounts and different spectra of natural gamma radiation. This difference in radioactivity between shales and sandstones/carbonate rocks allows the gamma tool to distinguish between shales and non-shales. Gamma radiation is usually recorded in API units, a measurement originated by the petroleum industry. 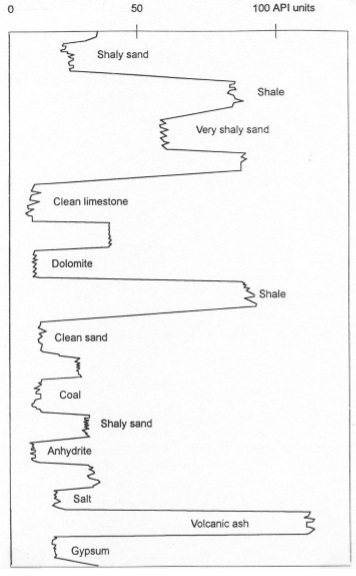 Shales often contain potassium as part of their clay content, and tend to absorb uranium and thorium as well. A common gamma-ray log records the total radiation and cannot distinguish between the radioactive elements, while a spectral gamma ray log (see below) can. An advantage of the gamma log over some other types of well logs is that it works through the steel and cement walls of cased boreholes. Although concrete and steel absorb some of the gamma radiation, enough travels through the steel and cement to allow qualitative determinations. Sometimes non-shales also have elevated levels of gamma radiation. Sandstone can contain uranium mineralization, potassium feldspar, clay filling, or rock fragments that cause it to have higher-than usual gamma readings. Coal and dolomite may contain absorbed uranium. Evaporite deposits may contain potassium minerals such as carnallite. When this is the case, spectral gamma ray logging can be done to identify these anomalies. Correlation between wells and depth determination. Spectral gamma ray logs are used in mineral exploration (phosphats, Uranium and potassium salts) as well as to identify specific clay types, like Kaolinite or Illite. This can be used for environmental interpretation as Kaolinite forms from Feldspars in tropic soils by leaching of Potassium; and low Potassium readings may thus indicate paleosols. The identification of clay types is also useful for calculating the effective porosity of reservoir rock.